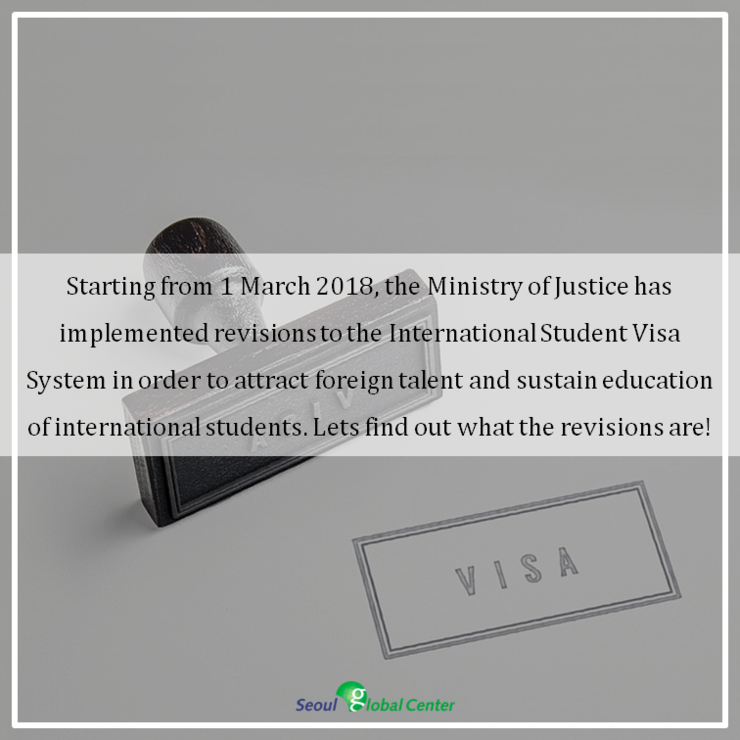 Starting from year 2018, the Ministry of Justice (Minister Park Sang-ki) has implemented revisions to the visa system for international students in order to attract foreign talent and sustain education of international students. The main contents of the revision include extended eligibility for the Work-Study visa, permit for participation in activities uncertified for current sojourn status, diversification of financial capability verification method and verification exemption, new prerequisites to part-time employment for international students, as well as measures to improve administration of international students. 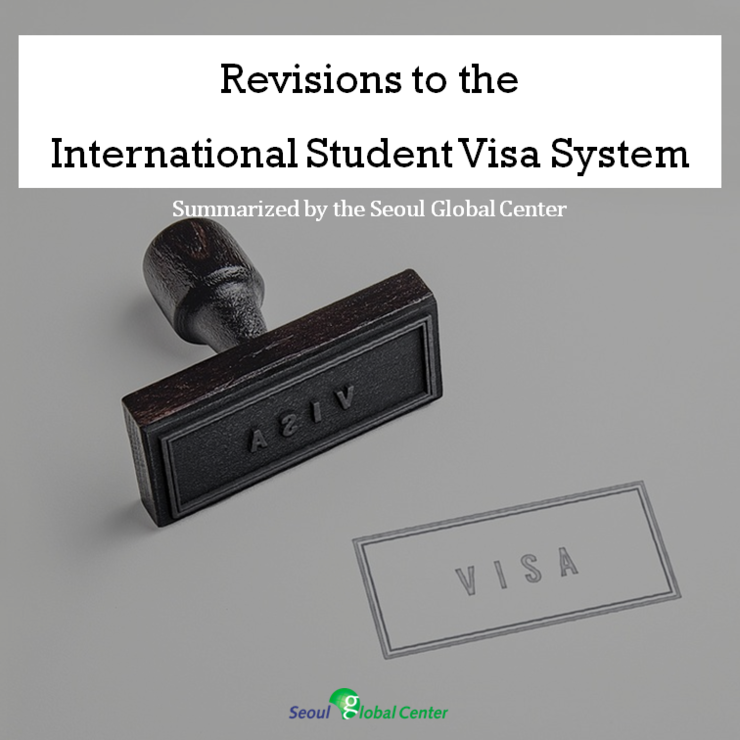 This revision is focused on the ongoing efforts to attract foreign talent, the active utilization of top science and technology researchers as well as the alleviation of problems and inadequacies of the international student visa system as reported by universities. In particular, the everyday difficulties and inconveniences of international students have been taken into consideration in this revision. 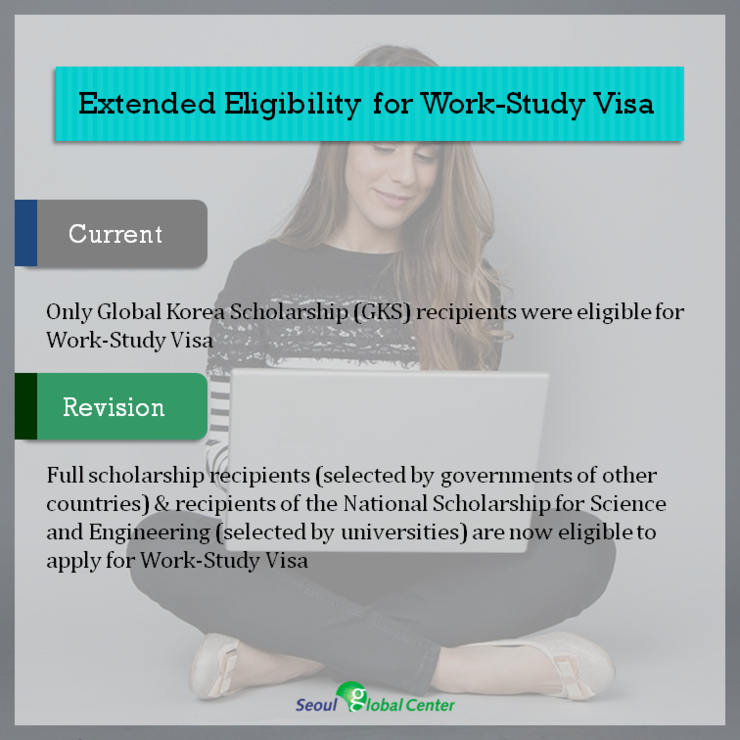 In seeking to attract foreign talent, the Work-Study Visa* was introduced (1 June 2016) to grant benefits* based on employment and long-term sojourn to Global Korea Scholarship (GKS) recipients only. There have been numerous requests to extend the limited eligibility of this visa. 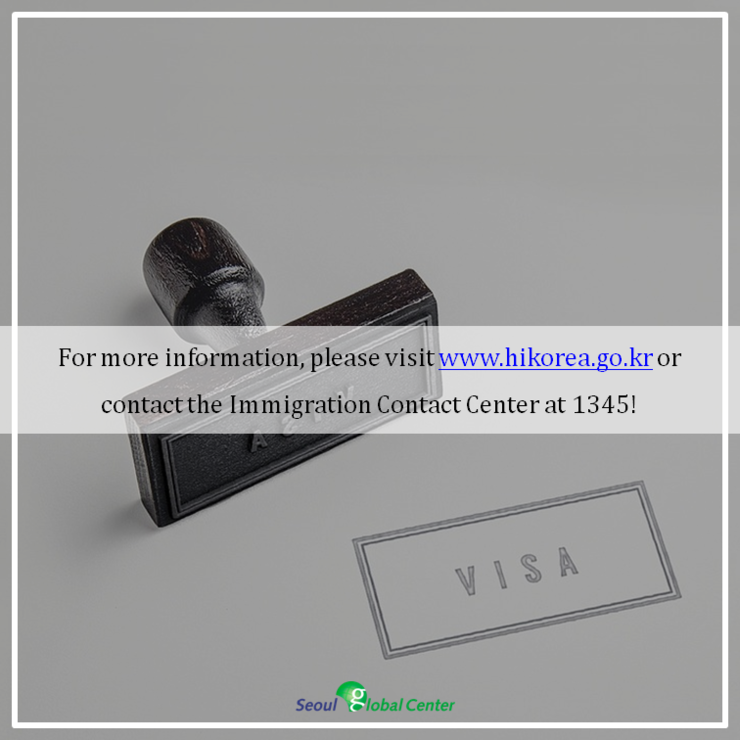 * For the E-7 Visa (Specially Designated Activities), employers of applicants are exempted from the legal requirement of keeping the number of foreign employees within 20% of the number of Korean employees. For the point-based F-2 Visa (Residency), applicants are granted an additional 10 points. For the F-5 Visa (Permanent Residency), applicants are exempted from adhering to income standards. The eligibility of the visa is now extended to full scholarship recipients (selected by governments of other countries) and recipients of the National Scholarship for Science and Engineering (selected by universities). However for the latter case, eligibility is only limited to recipients of the National Scholarship of Science and Engineering who have received full scholarship and have been recommended by the University President. 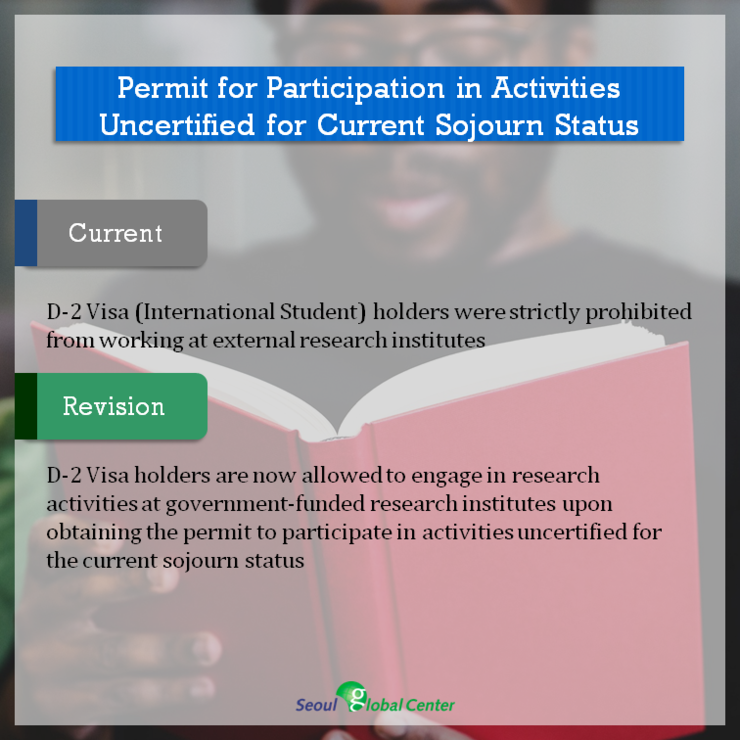 Based on visa regulations, D-2 Visa (International Student) holders are strictly prohibited from working at external research institutes. This restriction has been pointed out as a barrier to academic exchange in the field of Science and Technology. In order to secure foreign talent in preparation for the Fourth Industrial Revolution and the development of science and technology, D-2 Visa holders are now allowed to engage in research activities at government-funded research institutes* upon obtaining the permit to participate in activities uncertified for the current sojourn status. * Government-funded research institutes include research institutes in accordance with Article 8 of the Act on the Establishment, Operation and Fostering of Government-Funded Science And Technology Research Institutes, Etc., Article 3 of the Enforcement Decree of the Specific Research Institutes Support Act, Article 14 of the Special Act on Establishment of and Support for International Science and Business Belt. International students have had to submit a certificate of bank balance of at least a certain amount to prove their financial ability in order to obtain their respective visas, resulting in difficulties in raising a fairly large* amount of money. 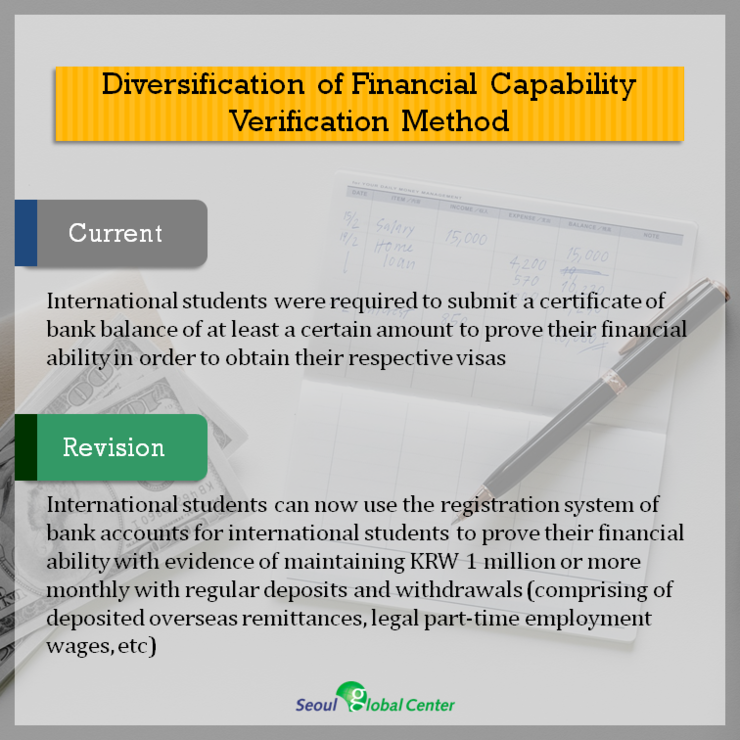 As such, the registration system of bank accounts for international students has been introduced, which international students can now use to prove their financial ability by evidence of maintaining KRW 1 million or more monthly comprising of deposited overseas remittances and legal part-time employment wages with a record of regular deposits and withdrawals. Students awarded the Global Korea Scholarship (GKS) are not required to prove their financial ability as university tuition fees and living expenses are fully supported by the Government. However, there were no specific regulations on the exemptions. There were also issues concerning children of Overseas Koreans (F-4 Visa) who come of age and wish to enroll in local universities but cannot meet the financial ability requirements, thereby having to leave the country or become illegal immigrants. 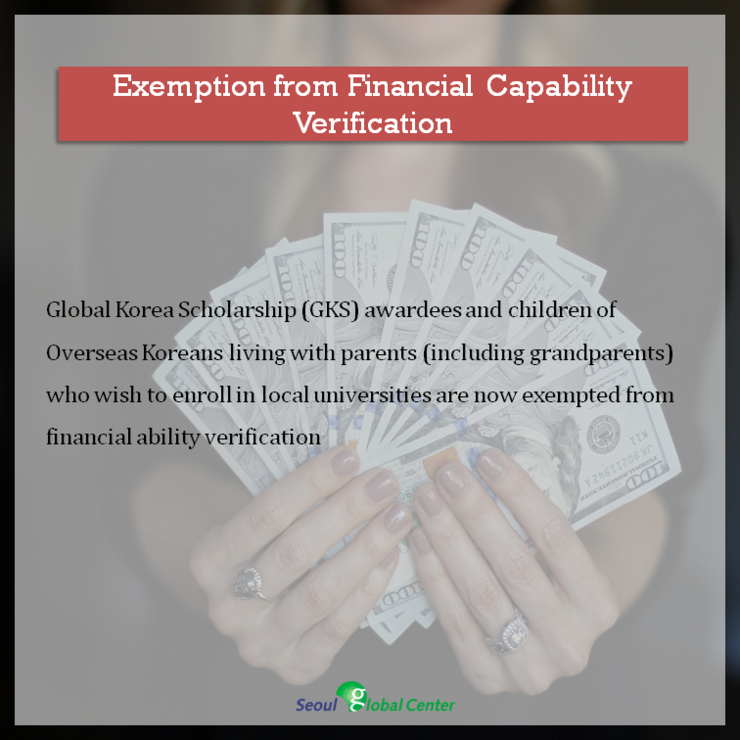 As such, Global Korea Scholarship (GKS) awardees and children of Overseas Koreans living with parents (including grandparents) who wish to enroll in local universities are now exempted from the requirement of having to prove their financial ability. Given that there is no impediment to studies, part-time employment* has been possible for international students who obtain permission to engage in activities uncertified for the current sojourn status regardless of their Korean language proficiency, academic performance or attendance. * Language training students, associate degree students, and undergraduate students can work up to 20 hours a week, while graduate students can work up to 30 hours a week. Except for language training students, students enrolled in associate degree programs and above do not have any restrictions on the number of work hours on weekends, public holidays and during school vacation. This has caused students to neglect their studies and ultimately affect the image of local universities. As such, the requirements for international students to engage in part-time employment are now dependent on the student’s Korean language proficiency*, attendance and academic performance** in pushing for commitment to one’s studies. ​** Language training students are required to have 90% or higher attendance rate and undergraduate students are required to attain a GPA of C or higher. Language training students have been able to extend their visas for up to 2 years even with poor attendance as long as tuition fees were paid, thereby abusing the visa as a means of seeking employment instead of focusing on Korean language studies. As such, language training students with less than 50% attendance rate are restricted from visa extension, while those with less than 70% attendance rate are permitted to extend their visa once only. For the latter case, students will not be able to extend their visa twice in a row if they maintain less than 70% attendance rate. 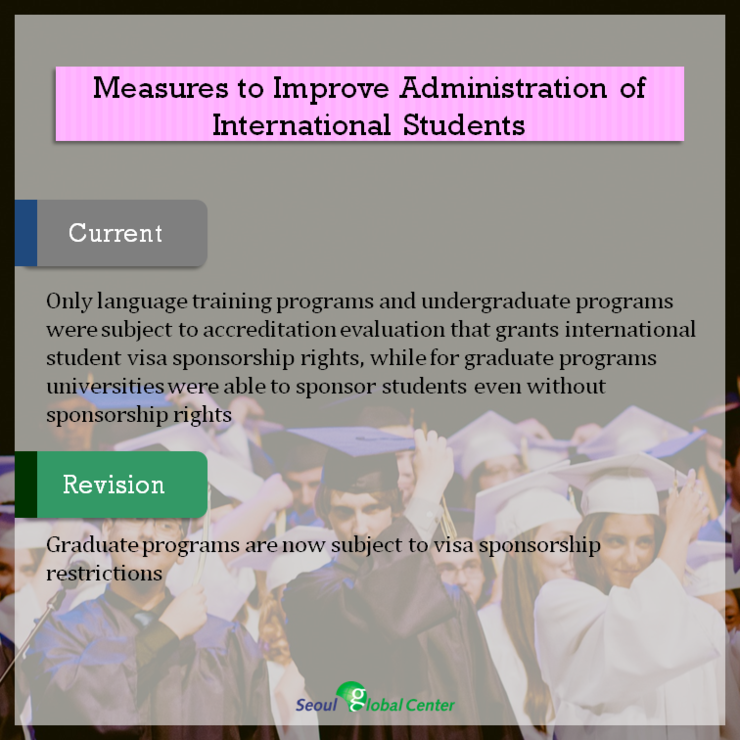 As graduate programs of universities are subject to accreditation evaluation that grants international student visa sponsorship rights* since 2017, in order to further commit to the enforcement of such evaluation, graduate programs are now subject to the above visa sponsorship restrictions. * Previously only language training programs and undergraduate programs were subject to the above evaluations, while universities were able to sponsor students in graduate programs even without sponsorship rights. The Ministry of Justice expects these revisions to reinforce the administration of the international student system through attracting foreign talent and actively utilizing top researchers studying in Korea in order to accelerate the development of science and technology and the improvement of international students’ academic abilities.